For the 22nd consecutive year, the Certificate of Achievement for Excellence in Financial Reporting has been awarded to Zion Park District by the Government Finance Officers Association of the United States and Canada (GFOA) for its comprehensive annual financial report (CAFR). The Certificate of Achievement is the highest form of recognition in the area of governmental accounting and financial reporting, and its attainment represents a significant accomplishment by a government and its management. 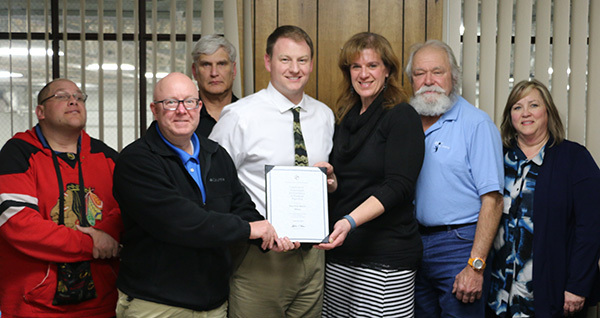 An Award of Financial Reporting Achievement has been awarded to the individual designated by Zion Park District as primarily responsible for preparing the award-winning CAFR. This has been presented to Douglas Congdon, retired Superintendent of Administrative Services. Park District employee, Deborah Isaacs, assisted in achieving the award. Under the direction of Eric Bradley, the “new” Superintendent of Administrative Services the District has made significant progress in operating with less tax dollars as a result of a flat property tax levy for 2014 and a reduced property tax levy for the upcoming 2015 fiscal year. The Board and staff have made a commitment to operate with a reduced budget that reflects the needs of the community to lower taxes for residents. The Park District has a positive outlook with the financial plan in place to meet its debts and to provide high quality recreation opportunities and park land maintenance for the community.